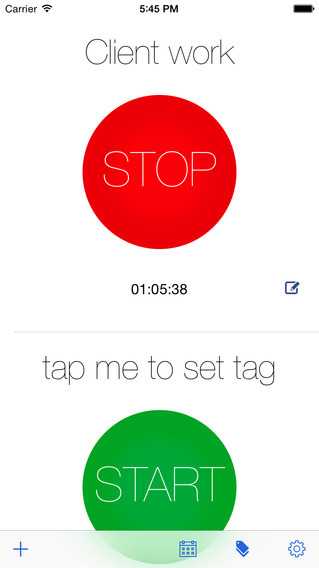 -Timers are now in a vertical list. Pull down or tap + to add one. Swipe to remove when you're done! -New iPad interface that uses split view. -Landscape mode is now fully available on the iPhone. -Removed annoying pop-ups throughout the app, and replaced them with friendlier notices. Still reading? Awesome! You should leave a 5 star review and be our hero today! 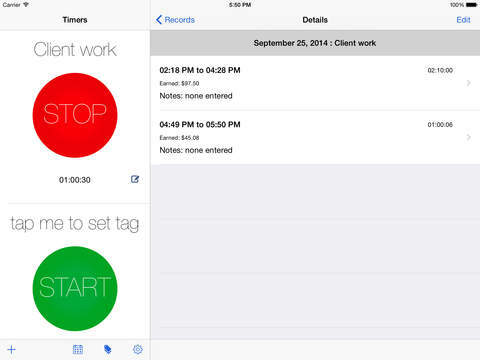 TimeTag is the time sheet application re-imagined. Its premise is simple: Allow you to track and tag your time. 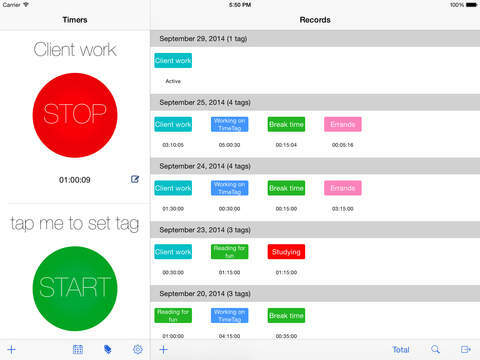 Unlike many other time sheet applications, TimeTag is designed to look great and be super simple to use. It avoids the long list of time records and instead automatically and intelligently groups together hours by tag and activity. This allows the you to quickly know where your day went without the need for a calculator and spreadsheet app. Norway Review: "As a freelancer this app is a lifesaver. Creates nice sheets which I can send to my customer along with the bill. Makes my life easier :)"
US Review: "Elegantly simple, well thought-out interface, where it seems every detail of it has been perfected. This app is so effective at what it does, and I consider it to be one of the most exemplary apps in the market." 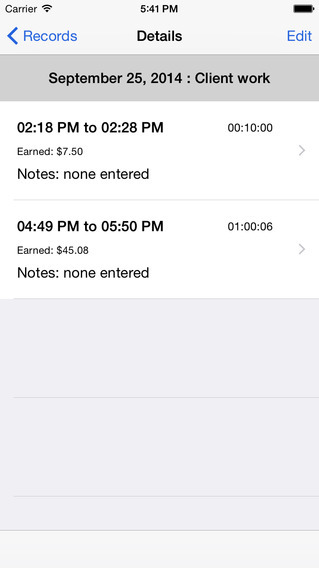 TheiPhoneAppReview.com: "For $3.99, this is an excellent time-organizing tool." *Export to your iPhone/iPad's calendar from within the app! *Supports Dropbox for exporting reports! Not sure if TimeTag is right for you? Feel free to check out our website for more material or you can always contact us in one of many ways (Email, Twitter or Facebook). We want you to love TimeTag as much as we enjoy working on it! We love great ideas and your feedback! If you have any feature ideas, please feel free to email us with the suggestion. Lots of features have gone in already that have been suggested by customers and more are coming! If you ever experience any issues with TimeTag such as a bug/crash or weird behavior, please contact me at capparsa@capparsa.com . I'm happy to look into it and I'm very active in getting updates out to remove issues.